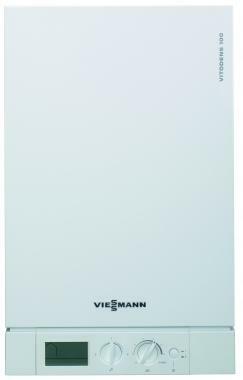 The Vitodens WB1B 100-w is a regular gas boiler by Viessmann. It is a condensing wall mounted boiler that is perfect for smaller homes. It’s a highly efficient unit coming with an output of 16kW and a efficiency rating of 89.1% making it B rated and with it also exceeding the SEDBUK minimum efficiency requirements - this is done through the built in stainless steel inox-radial heat exchanger. This boiler is an open vent model that is perfectly suited for integration into a standard sized cupboard in a kitchen - out of sight and out of mind. It has a depth of only 285mm and as well as this boiler is also able to be used in a vast number of other applications where space may be limited making it perfect for the smaller homes. It boasts a weather compensation option and is also available in LPG or natural gas. This boiler has a large user display making it easy and clear to use. It also has a selection of other outputs within the range such as the 13 kW, 16 kW, 19 kW, 26 kW and 35 kW, making the boiler able to fit you and your homes needs. This model is also available with a 5 year warranty to give you peace of mind that you have bought a reliable boiler. Great to install, commission and service afterwards, with all the features you want on a boiler.